Beargrass Christian Church is "a warm and welcoming, faithful and friendly congregation where people from many different church backgrounds are welcome." 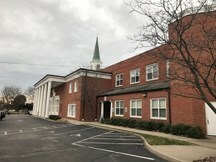 Beargrass Christian Church is centrally located in St. Matthews, at the corner of Shelbyville Road and Browns Lane. Enter through the office doors facing Shelbyville Road, take the elevator or the stairs to the balcony floor, and we are located in Room 201.